Either late last year, or possibly in one of my early ‘new year resolution’ posts, I know that I said two things I’d like to do more of in 2016 were camping, and walks on the Cape to Cape walk track. My Easter has involved two of these things. Easter Sunday started with the Easter egg hunt for the kids, and then me baking ‘German Apple Pancakes‘ – a recipe I found on Facebook. I think this will start a tradition because believe me, this was YUMMY! Later, my gorgeous neighbour Carrie and I hiked a 9km section of the Cape To Cape track, from Prevelly (the communication tower at the top of Baudin Drive) to Redgate Beach. As always, it’s a gorgeous walk with views of Boodjidup Creek, a crossing at Frank Mouritz bridge, and views of the stunning coast, but what I find at Easter is that it’s even more special – because of the solitude. To put that in perspective, Easter in Margaret River/Dunsborough/Busselton/Cowaramup is always a manic holiday time of year. There are people everywhere, and yet once we started this walk we didn’t see a soul all along the most fantastic stretches of beach. We were walking along and talking about the book The Martian, which Carrie is currently reading – and which is the subject of the new Matt Damon movie – and Carrie commented that “we could be on Mars” given the isolation. What is kind of surreal is that you know at the towns north and south and on Caves Rd that runs parallel to the coast only a few kilometres away, it’d be like rush-hour in Manhattan. (Well, almost). 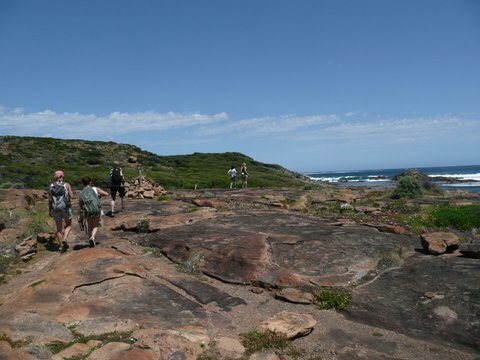 The first half of this part of the walk is fairly easy, and very pretty, putting you at one stage right on top of the Leeuwin Naturaliste Ridge with views left over forest and farmland and right to the coast and a blue horizon. Along with countless chocolate eggs and two bottles of champagne (thanks Mum), the Easter Bunny bought us two extra special presents this year. The first was some lovely Cara Ratajczak prints (2 of the 3 I bought pictured above) at the Gracetown Easter Art Exhibition and the second was this Coromal camper/caravan. Add to the last few days a catch up Easter Saturday night with friends, some lovely baby news from neighbours and baby news for one of the card-girls, plus a win for the West Coast Eagles to get AFL season under way, and well, it’s been a darn fine Easter! Hope yours was awesome too! Here’s what I’ve been up to this morning. 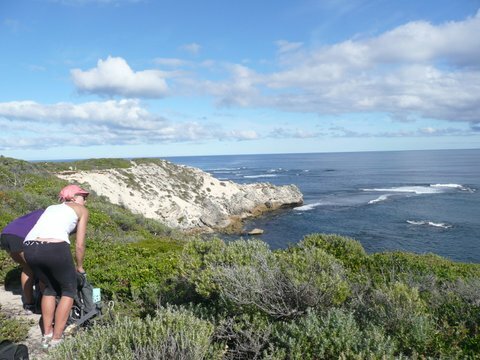 To celebrate a friend’s birthday, a group of us walked a part of the Cape to Cape walking trail in the Margaret River region. This is the second part of the Cape track that I’ve done, the earlier walk being in May from Ellensbrook Homestead to Prevelly. 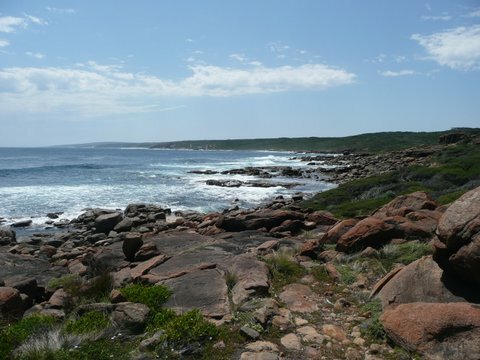 Today we’ve walked from Gallows surfing spot, south to Gracetown past local surf and fishing spots such as Guillotines, Whalesback, and North Point at Gracetown. Once again, the weather’s been stunning. 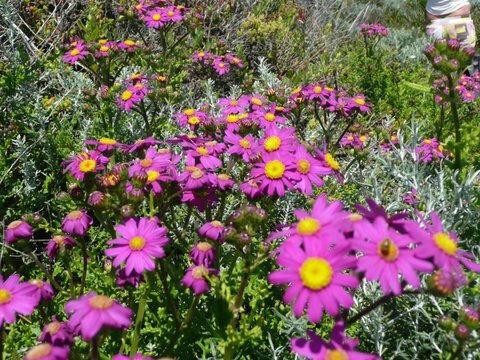 The wildflowers are out and the bush and coast are superb. One thing that wasn’t so much fun was spotting a Dugite on the track, about ten metres after we’d started the walk! Other than that little bit of excitement… it was close to two hours of fresh air, sea breeze, and fun. I’ve had a wonderful weekend. I’ve finished the first round of edits for my next book, So Far Into You, which is due for release in October this year with Escape Publishing. I’m working with Belinda Holmes on edits, and after a bit of a struggle with my own self-doubt late last week, I managed to get in the swing of the book and finish it Saturday afternoon. My additions (there are lots) are now back with Belinda for her input. I’ll probably see them once more before we count this book done. In Margaret River it has been the annual Margaret River Readers and Writers Festival. Lots of bookish friends have been staying in Margies and visiting the Festival each day. Carol Seeley who blogs at Reading, Writing and Riesling, has written great wrap-ups of each day of the Festival. She told me romance author Fiona Palmer’s talk was particularly inspirational, and I know Carol enjoyed meeting one of her favourite authors, Robert Gott. Also visiting for the festival were three people who I have only previously cyber-met, but who have become friends, particularly the lovely and talented Louise Allan who had her novel, Ida’s Children, final in the 2014 City of Fremantle TAG Hungerford Award. Louise, Rae Hilhorst, and Swanbourne Bookcaffe manager and aspiring writer, Emily Paul, travelled from Perth together and had weekend passes to the Festival. On Saturday night, Louise, Rae and Emily came to visit at my place. Hubby lit the firepit at the base of our block (I think this was so he could watch football uninterrupted by four women talking about books), and we sat watching the rising moon and the stars, sharing several glasses of wine, nibbles and a meal around the fire. I don’t think we stopped talking for about 3.5 hours, except to take another sip of wine. It was so cold away from the fire that our white wine didn’t need to be in an ice bucket, and our red wine ended up rather chilled (to say the least). It was a great evening, and very inspiring, like I find most times I get the chance to talk books and writing with other authors, bloggers and writers, no matter what stage of their writing careers. (#DirtyDraft sessions, I’m thinking about you). Looking south from the carpark at Gnoocardup (pardon the spelling). Imagine an Irish woman trying to mangle this pronunciation… it’s said: Newkardup. Topping off the weekend, things got physical today with a group of five ladies enjoying a walk along a 12.5km stretch of the Cape To Cape walking track. We dropped a car at Sea Gardens cafe in Prevelly this morning then drove back to Ellensbrook Homestead and walked from Ellensbrook to Prevelly, through Gnoocardup (which I shudder when I try to spell), Joey’s Nose, Kilcarnup and eventually to the Margaret River mouth. 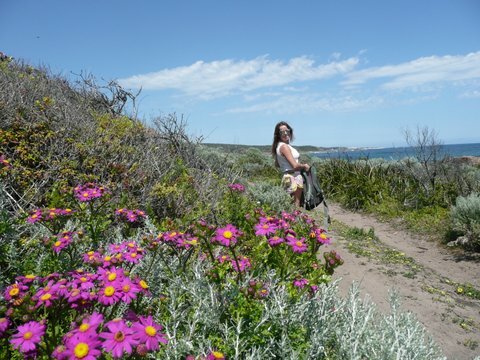 The Cape to Cape walk trail, at Cape Mentelle. So, a wonderful weekend, capped off with a footy win for the West Coast Eagles… and there’s still another day going free tomorrow. Rumour is if the weather holds, it will involve fishing at Augusta. Or at the very least, lunch at the Augusta pub.